At Alaska CyberKnife, we’re proud to provide supportive, compassionate, and comprehensive cancer treatment to the city of Anchorage and the larger community of Alaska. We understand that every part of the cancer treatment process can be difficult – even telling your loved ones about your diagnosis. 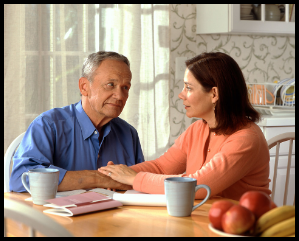 If you’ve recently been diagnosed with cancer, it may be difficult to know how to navigate the delicate conversations discussing your condition with loved ones. One of the most important things is to start by understanding your own feelings. Before telling loved ones about your condition, you may find it a good idea to spend some time understanding your own reactions. It’s normal to experience feelings of sadness, anger, or fear, and to have those feelings change over time. Often, these feelings can be strong and sometimes overwhelming – and that’s ok. Your feelings in response to a cancer diagnosis are a normal part of the process, and it’s important to make space for and accept the way you’re feeling about your diagnosis. It not only helps you through the treatment process, but can also help you talk with loved ones about it. The process of telling loved ones about a cancer diagnosis will be different for everyone, and every conversation you have will go differently. Most patients will start with their closest relationships like their spouse or partner, their family, and their close friends, before moving onto other relationships. Often, the news can be overwhelming for the people in your life, and they may not know how to react. Some people may seem sad or scared of losing you, while others may try to act normal or overly cheerful. Even though they all want to support you, they may not know how. In these conversations, don’t be afraid to directly tell loved ones how you want to be supported. While it may seem too forward or needy, in reality, many people will be happy to hear your perspective because they want to support you in the best way possible. While it may be difficult, it can often be helpful to explain your own feelings about the process to those you feel comfortable with. It can be hard to open up in this way, but letting close, trusted relationships know about your feelings can help with the healing process and provide a source of strength and support as you continue treatment. No matter how you choose to have these conversations, it’s important to care for yourself and do what feels right for you at every stage of the healing process. The road to healing after a cancer diagnosis is a long and difficult one, but with help and high-quality treatment, it’s possible – and if you’re looking for a form of cancer treatment, Alaska CyberKnife would be thrilled to help. As a premier cancer treatment facility in Anchorage, AK, we’re proud to provide world-class cancer treatment in a supportive, compassionate environment. Call us today at 907-312-2112 to learn more about how we can help you beat cancer through a convenient, non-surgical treatment solution. We hope to hear from you soon.